Palo Alto, CA. August 18, 2014 - Artec Group, a leading developer and manufacturer of professional 3D software and hardware, announces today the first public release of the Artec Scanning Software Development Kit (SDK). Whether users need to tailor existing software to support current projects or develop new software to meet a unique need, Artec Scanning SDK gives them full control over the scanning process. This new offering will expand the use and capabilities of Artec’s high-resolution, full-color, handheld 3D scanners within the medical, industrial, engineering, and 3D printing industries. Artec Group offers two high-quality professional 3D handheld scanners: the Artec Eva and Artec Spider producing high quality scans with minimal scanning time. Both popular scanners can be used to scan a broad range of objects even those with sharp edges and tiny parts, or moving objects with accurate results. Now with the first public release of the Artec Scanning SDK, users will be able to take full control of the scanning process. 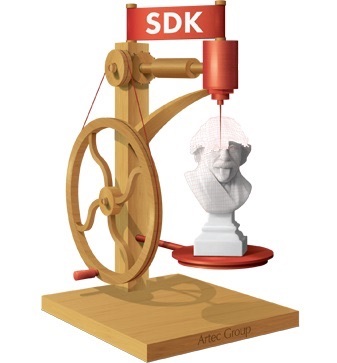 The SDK also provides access to individual frames, including each frame’s 3D meshes and texture. Frames can be aligned and merged to create a textured 3D model. With the new flexibility that is provided with the Artec Scanning SDK, software development and other companies will be able to create new or use existing software with Artec’s industry-leading scanners. "The excellent quality and portability of our 3D scanners make them the perfect fit for a variety of industries from medical to entertainment,” said Artyom Yukhin, president and CEO of Artec Group. “This means that our scanners are called upon to work with a lot of different industry specific tasks, which requires all types of software. The Artec Scanning SDK is our way of ensuring that our scanners will be compatible with almost any software a user may currently have in place." Artec Group is an international group with subsidiaries in the USA (Palo Alto), Russia (Moscow) and Luxembourg. Artec develops and produces innovative 3D solutions and products. Artec has a team of professionals expert in the collection and processing of 3D surfaces as well as biometric facial recognition. Artec’s products and services can be used in many industries, such as in security technology and in engineering, medicine, media and design, entertainment, fashion, historic preservation, and many more. The corporate culture of Artec Group and its subsidiaries Artec 3D and Artec ID is characterized by a combination of Russian Engineering, European business ethics and the spirit of innovation of Silicon Valley. Shapify, the service for the creation of 3D characters, was designed and introduced in 2013 by the Artec Group.